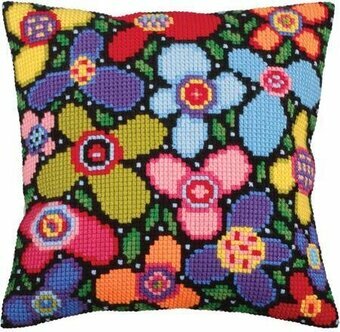 Needlepoint pillow kit featuring flowers. This kit includes Sudan stramin, 20 Cross Stitches per 10cm with printed color-pattern, acrylic yarn, needle and easy to follow instruction. 15.75" x 15.75" (40 x 40cm). 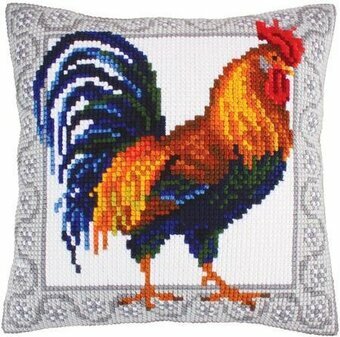 Needlepoint pillow kit featuring a rooster. This kit includes Sudan stramin, 20 Cross Stitches per 10cm with printed color-pattern, acrylic yarn, needle and easy to follow instruction. 15.75" x 15.75" (40 x 40cm). Kit includes hand painted large count (4.5 Count) Canvas, 100% acrylic yarn, needle, chart, & instructions. Finished size: 16" x 16" (40cm x 40cm). Stitch-Ups needlepoint kits are constructed with color coordinated suede backing. Designs are in color on #14 canvas. Kits include: Pre-assembled product, needle, easy to follow instructions and cotton floss. Finished Size: 4" Round Ornament. Suede Backing Color: Green. Stitch-Ups needlepoint kits are constructed with color coordinated suede backing. Designs are in color on #14 canvas. Kits include: 100% cotton floss, needle & easy to follow instructions. Fabric backing attached. 4" round. 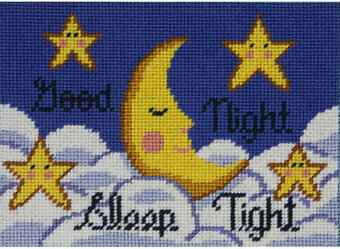 Printed in color on #14 interlock canvas for ease of stitching, this needlepoint kit features the moon and stars. This would be great for a baby's nursery! This needlepoint kit includes: 100% cotton floss, needle, color placement chart, easy to follow instructions and a color picture of the finished product. Can be used as a framed picture or a pillow insert or whatever creative outlet you can think of. Design Size: 7" x 5". Kit contains pre-sorted cotton thread with some yarn, full-color print on 14 mesh cotton canvas, felt, needle, and easy instructions with an alphabet. Stocking is 16" long. 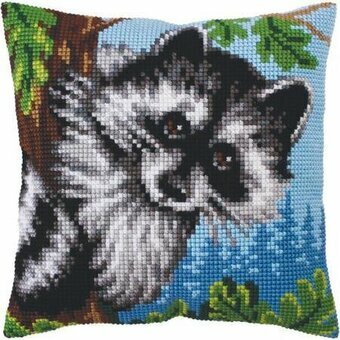 Create a beautiful piece of art to display in your home with this needlepoint cushion kit. This package contains one 100% cotton color printed canvas, 100% acrylic yarn, one needle and easy to follow instruction. Design size: 15.75 x 15.75 inches. The design is hand painted exactly upon the weaving threads of the canvas. 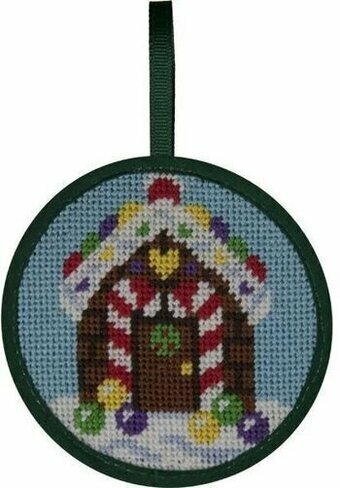 This needlepoint kit contains a large hole 100% cotton Zweigart canvas, 100% acrylic yarn, one needle and instructions. Finished Size: 16x16 inches. 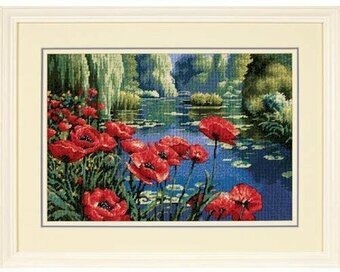 Needlepoint Kits - Item #PN-0155210 - See More Items Like This On Clearance! 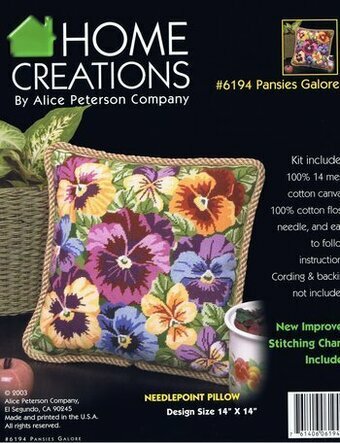 Needlepoint pillow kit featuring flowers. This kit includes full color design printed on 5 mesh canvas, 100% acrylic yarn , gold eye needle and detailed instructions in 10 languages. Does not include pillow backing or stuffing. To create pillow, use Cushion Finishing Kit #CDA-5999. 15.75" x 15.75". Stitch-Ups needlepoint kits are constructed with color coordinated suede backing. Designs are in color on #14 canvas. Kits include: Pre-assembled product, needle, easy to follow instructions and cotton floss. 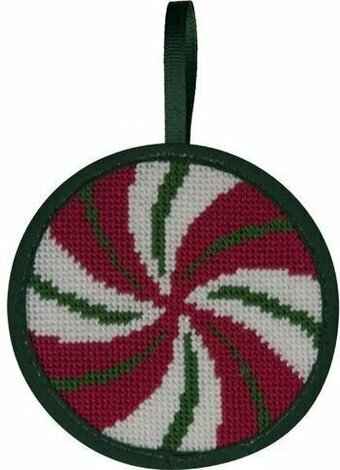 Finished Size: 4" Round Ornament. Suede Backing Color: Navy. Welcome this trio of penguins into your home this Christmas season. 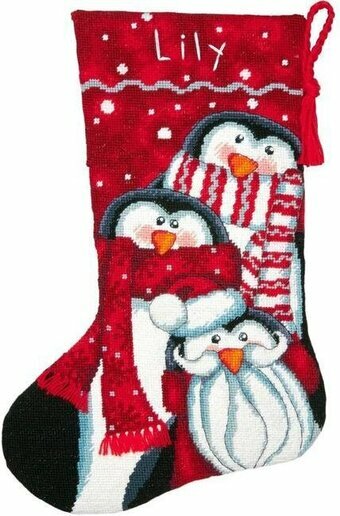 The delightful Holiday Penguins Stocking by Dimensions is stitched predominantly in yarn and will appeal to the young and the young at heart. Finished size: 16" long. This needlepoint kit contains presorted wool and acrylic yarn, cotton thread, 12 mesh canvas printed in full color, felt, needle, and complete instructions with an alphabet for personalizing. 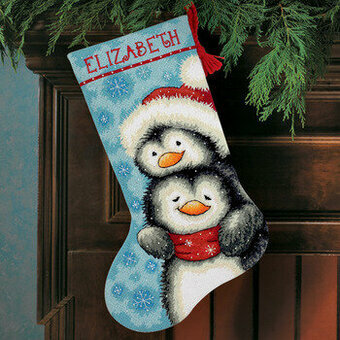 Our adorable Hugging Penguins Stocking is ready to spend the holidays with you! 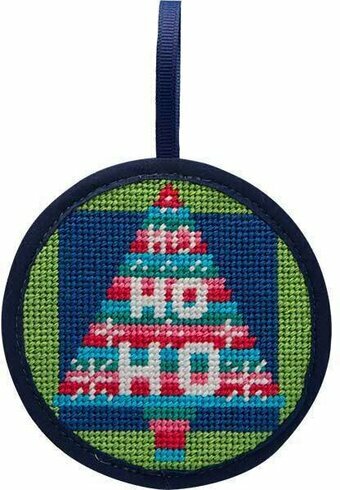 This delightful needlepoint stocking stitches up quickly using mostly wool yarn with some cotton thread. Finished Size: 16" Long (41 cm). Kit contains pre-sorted wool yarn and cotton thread, full-color print on 12 mesh cotton canvas, felt, needle, and easy instructions with an alphabet. Designer: Makiko. Illustration by Makiko. This Needlepoint Kit comes complete with: 12 Count Interlock Canvas Printed in Full Color, Acrylic Yarn, #18 Tapestry Needle, Fully Illustrated Instructions. 12" x 12". Worked on a full-color, printed canvas, and predominantly or completely stitched in thread. Finished Size: 16" x 11" (41 x 28 cm). 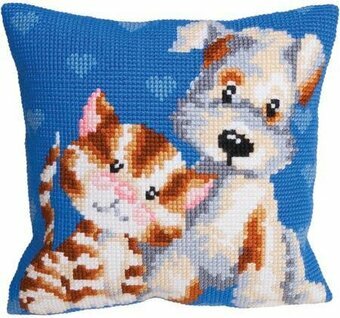 Needlepoint pillow kit featuring a cat and a dog. Includes full color design printed on 5 mesh canvas, 100% acrylic yarn , gold eye needle and detailed instructions in 10 languages. Does not include pillow backing or stuffing. To create pillow, use Cushion Finishing Kit #CDA-5999. 15.75" x 15.75" (40 x 40cm). Kit includes 4 Ct. printed canvas, yarn, needle and instructions. Finished size: 14" x 14". Backing fabric not included. 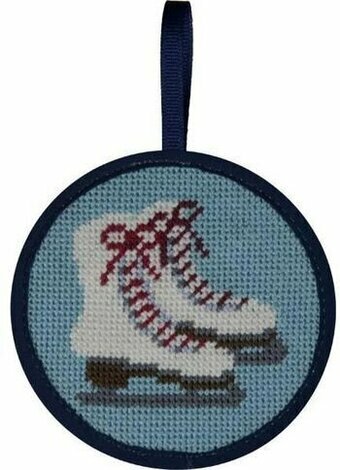 Needlepoint Kits - Item #PER-9675 - See More Items Like This On Clearance! 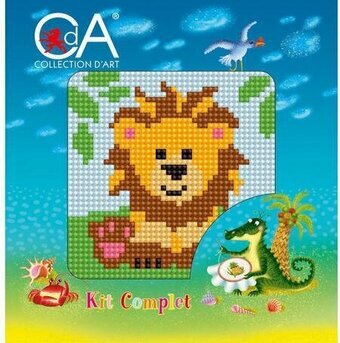 Needlepoint kit featuring a lion. This 14 mesh canvas is 100% Cotton Stramin and 40 Cross Stitches per 10cm. Kit includes: canvas, soft cotton yarn, gold eye tapestry needle and instructions. 5.9" x 5.9". 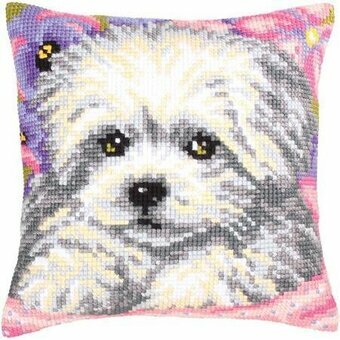 Needlepoint pillow kit featuring a dog. This kit includes Sudan stramin, 20 Cross Stitches per 10cm with printed color-pattern, acrylic yarn, needle and easy to follow instruction. 15.75" x 15.75" (40 x 40cm). 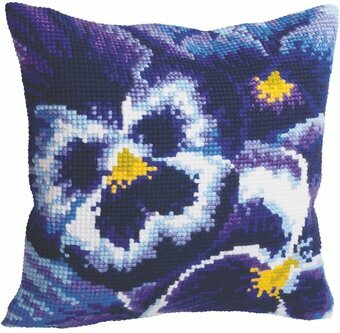 Create a beautiful piece of art to display in your home with this needlepoint cushion kit. This package contains one 100% cotton color printed canvas, 100% acrylic yarn, one needle and easy to follow instruction. Finished size: 15.75 x 15.75 inches. 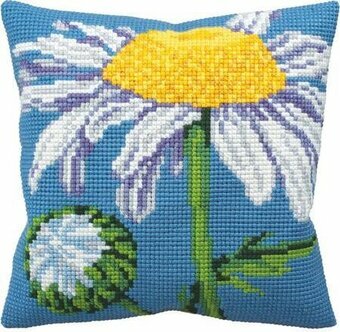 Needlepoint pillow kit featuring daisy flowers. This kit includes full color design printed on 5 mesh canvas, 100% acrylic yarn , gold eye needle and detailed instructions in 10 languages. Does not include pillow backing or stuffing. To create pillow, use Cushion Finishing Kit #CDA-5999. 15.75" x 15.75". 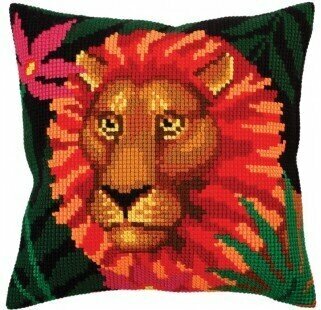 Learn to do Needlepoint! 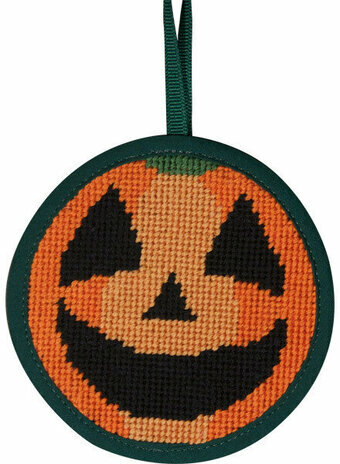 Kit contains printed 12-mesh canvas, wool yarn and cotton thread, needle, 6-inch hoop, and easy instructions. Finished Size: 6" Diameter. (15 cm). 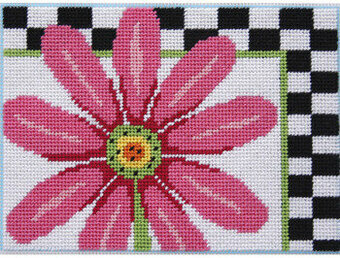 Needlepoint Kits - Item #K73374 - See More Items Like This On Clearance! 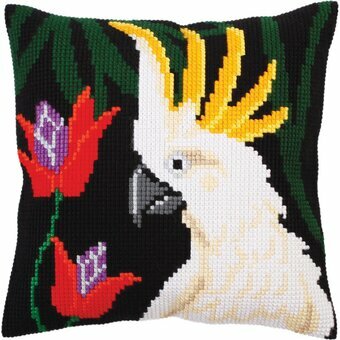 Needlepoint kit featuring a tropical bird. 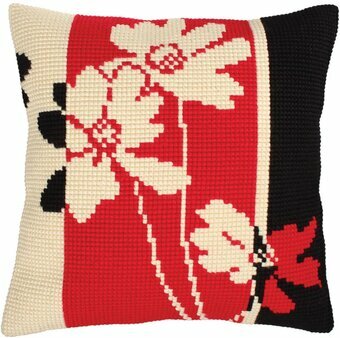 Create a beautiful piece of art to display in your home with this needlepoint cushion kit. This package contains one 100% cotton color printed canvas, 100% acrylic yarn, one needle and easy to follow instruction. Finished size: 15.75 x 15.75 inches. 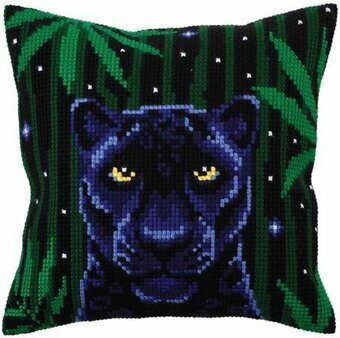 Needlepoint kit featuring a jaguar or panther. 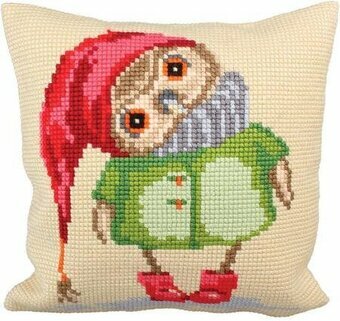 Create a beautiful piece of art to display in your home with this needlepoint cushion kit. This package contains one 100% cotton color printed canvas, 100% acrylic yarn, one needle and easy to follow instruction. Finished size is 15.75 x 15.75 inches. The design is hand painted exactly upon the weaving threads of the canvas. This needlepoint kit contains hand painted canvas, all the thread and yarn you need, the needle and instructions in 8 languages. Finished Size: 16x16 inches. 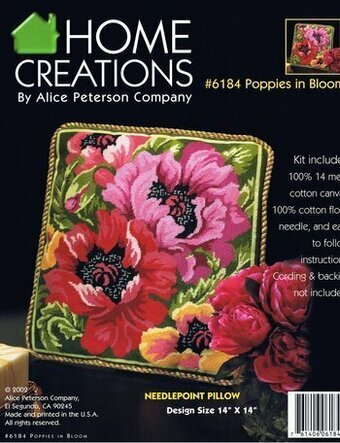 Needlepoint Kits - Item #PN-0147502 - See More Items Like This On Clearance! This needlepoint kit includes hand painted large count (4.5 Count) Canvas, 100% acrylic yarn, needle, chart, & instructions. Finished size: 16" x 16" (40cm x 40cm). 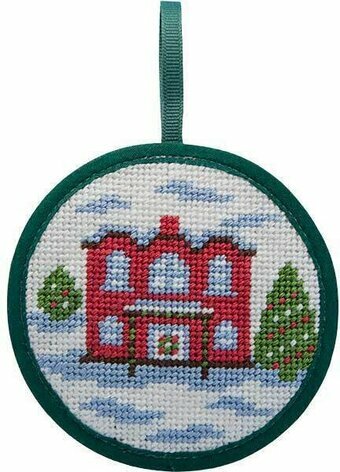 Needlepoint Kit includes 100% 14 mesh cotton canvas, 100% cotton floss, needle, and easy to follow instructions. Cording and backing not included. Design size: 14" x 14". 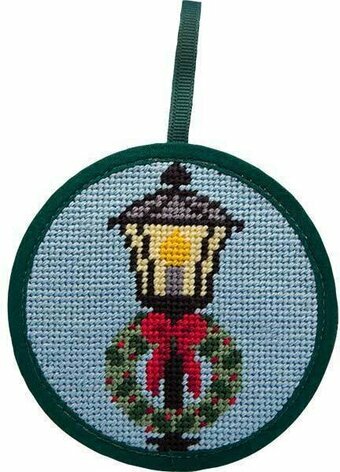 Needlepoint Kits - Item #PER-9670 - See More Items Like This On Clearance! 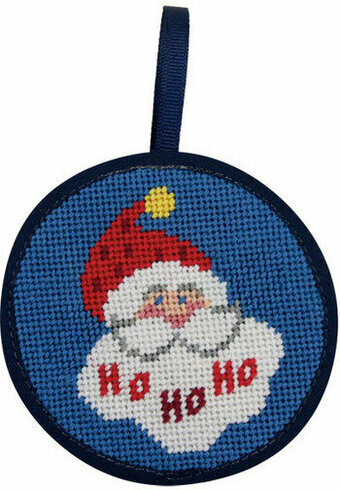 A plethora of patterns surrounds a whimsical Santa in this needlepoint design stitched predominantly in yarn. 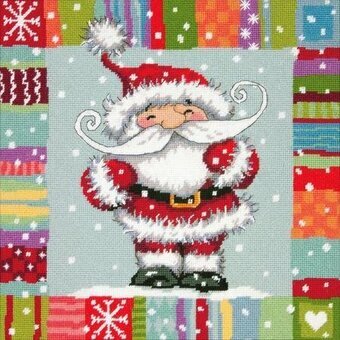 Patterned Santa by Dimensions will brighten your holiday decor whether framed or finished as a pillow. Finished size: 14" x 14". This needlepoint kit contains presorted wool and acrylic yarn, cotton thread, 12 mesh canvas printed in full color, needle, and complete instructions. Pillow finishing materials are not included. 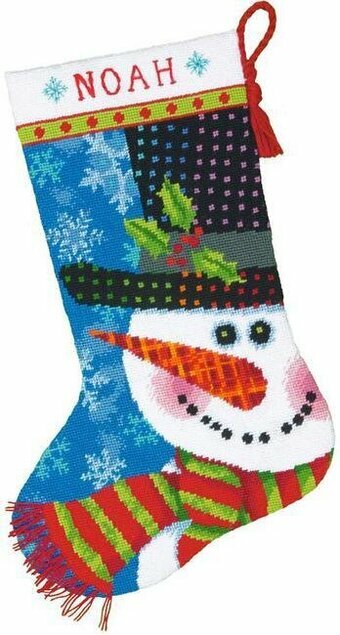 Needlepoint Christmas Stocking Kit featuring a snowman. This needlepoint kit contains full color printed 12 mesh canvas, felt, pre-sorted 100% wool yarn, acrylic yarn, thread, one needle and easy to follow instructions. Mat/frame are not included. Finished size: 16 inches long. Gorgeous designs, vibrant colors, and the highest quality materials are all things that Dimensions brings to you in each of their needlework kits. This package contains one 14-mesh canvas with full-color print, presorted 100% wool yarn, one needle, and instructions. Design: Patterns On Blue. Finished size: 14x14 inches. Winter themed needlepoint kit featuring a penguin. The design is hand painted exactly upon the weaving threads of the canvas. 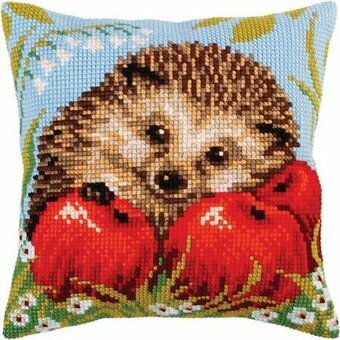 This needlepoint kit contains a large hole 100% cotton Zweigart canvas, 100% acrylic yarn, one needle and instructions. Finished Size: 16x16 inches. Printed in color on #14 interlock canvas for ease of stitching. This needlepoint kit includes: 100% cotton floss, needle, color placement chart, easy to follow instructions and a color picture of the finished product. Can be used as a framed picture or a pillow insert or whatever creative outlet you can think of. Design Size: 7" x 5". This Pink Flamingo needlepoint by Dimensions really makes a statement! Vivid yarn colors make this design a standout whether you hang it on a wall or finish it as a pillow. Finished size: 14" x 14". This needlepoint kit contains presorted wool and acrylic yarn, full-color print on 12 mesh canvas, needle, and instructions. Pillow finishing materials not included. These smiling Snowman and Penguin friends bring out the kid in everyone! 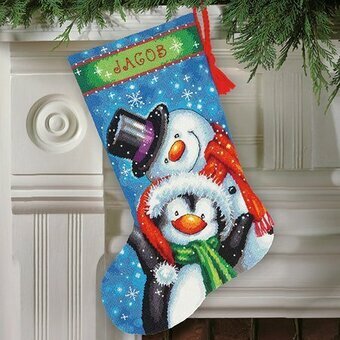 This Polar Pals Stocking in needlepoint by Dimensions features bright colors and a contemporary feel. Finished size: 16" long. Designed by Makiko. This needlepoint kit includes: Presorted cotton thread, Wool yarn for hanger, Full color print on 14 mesh canvas, Felt for stocking back, Needle, and Easy instructions with an alphabet. Needlepoint kit featuring a Puppy. 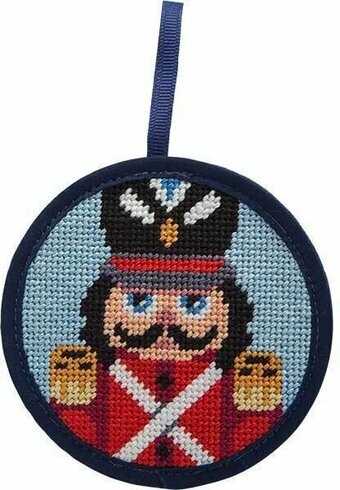 This needlepoint kit includes 100% cotton canvas, 100% cotton yarn, one needle and instructions. Finished size: 5 1/2" x7"
Needlepoint Kits - Item #CDA-3080K - See More Items Like This On Clearance! 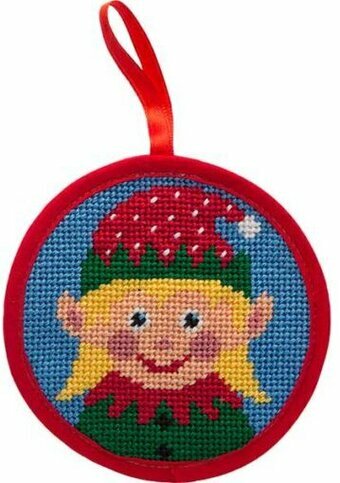 Needlepoint Kits - Item #PN-0155798 - See More Items Like This On Clearance! 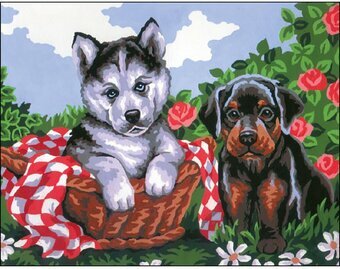 Needlepoint Kits - Item #CDA-5229 - See More Items Like This On Clearance! 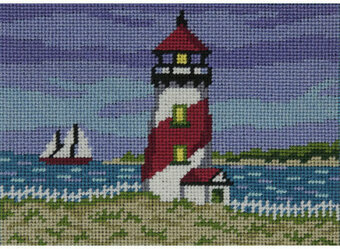 Printed in color on #14 interlock canvas for ease of stitching, this needlepoint kit features a red lighthouse. This needlepoint kit includes: 100% cotton floss, needle, color placement chart, easy to follow instructions and a color picture of the finished product. Can be used as a framed picture or a pillow insert or whatever creative outlet you can think of. Design Size: 7" x 5".